It’s a huge question that everyone is asking themselves… Which is the better purchase? Which is going to give me more for my money? The Cricut Explore that is brand new? Or the Silhouette Cameo that has been out for a couple years? When spending so much money on a personal cutting machine it is okay to ask yourself those questions and to do a lot of research. When buying my Silhouette I looked and looked for a post that would compare the old Cricut to the Silhouette Cameo. I couldn’t find anything and I was really disappointed that there wasn’t anything. Sure you can look at both of their websites, but that is each company giving you only the super good qualities of their machine to make it look better than their competitors machine. Well I am here to give you my honest and true opinion. 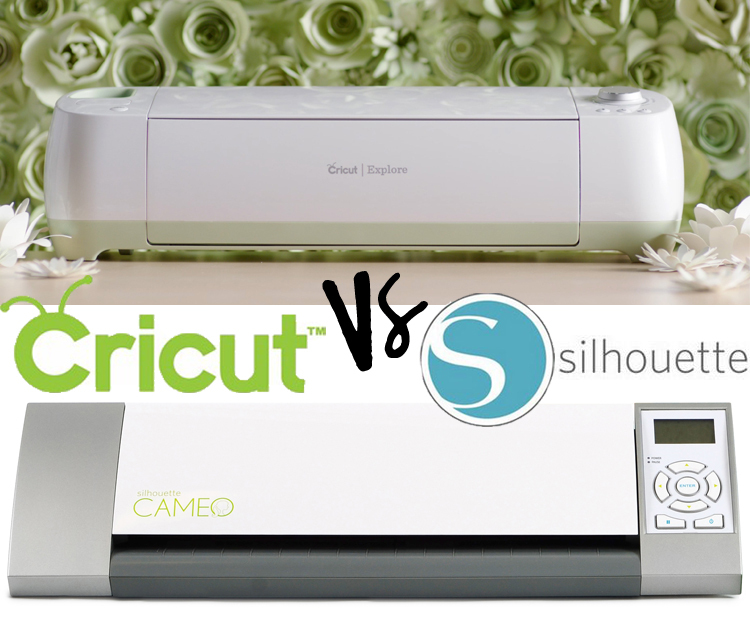 The battle of the Cricut Explore VS the Silhouette Cameo! I was so excited to play with the new Cricut Explore machine when they were at ALT (that huge blog conference I attended last month) since I hated my Silhouette so much and was looking to buy something new. Nathan from Cricut had me set up a very intricate Thank You card after I had expressed my concerns with their new machine that it would tear like my Silhouette. I was absolutely amazed that the Cricut Explore machine cut out such a small intricate design with absolutely no problems. No tearing, no ripping, no cutting on the wrong part of the mat, nothing! I was amazed!! Next, Nathan pulled out a piece of vinyl and had me cut out leopard print with the Cricut Explore machine. Yes, tiny leopard print. The settings were so easy to change with the easy use dial on the side of the machine to switch it from card stock to vinyl. I opened up the program on the internet, searched leopard print, selected it, pushed cut and away it went! It literally took me 45 seconds to get it set up on the program and push cut. 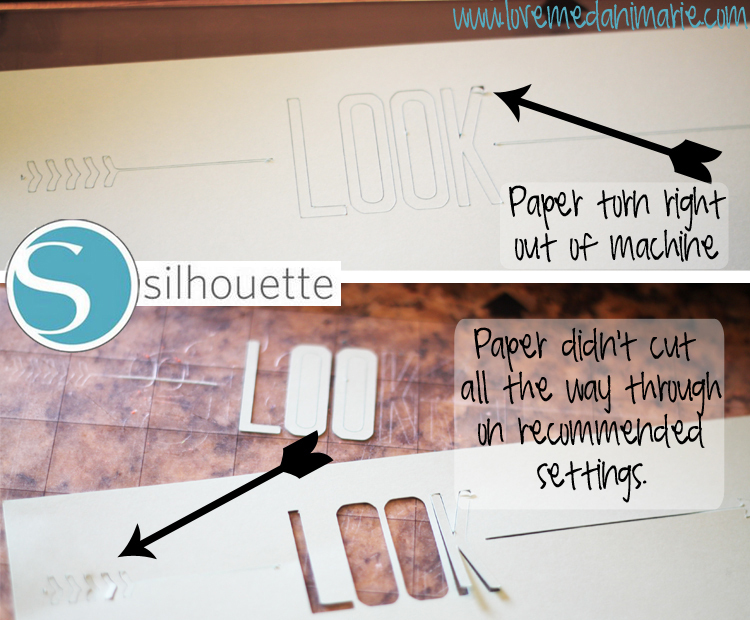 Seriously, the Cricut Explore machine makes your cutting so easy and simplified! I wanted an easy to look at way for you to decide which machine is best for you, so I have made a list of the pros of each machine. My choice 100% is the Cricut Explore macine. From its quiet cutting to the millions of possibilities it gives you with cutting metal, wood, everything! I love having a personal cutting machine, but I hate that it takes so long to pull everything out, set everything up, and get it going. With the Cricut Explore machine, that time is cut in half. You can cut wirelessly from your iPad. Yes you heard me right. It takes one time to cut, no messing with your settings, reloading it because it cut in the wrong spot, none of that. I am so excited to pull it out for so many projects that will now be quickly completed! Stay tuned for many tutorials that can be done with your Cricut Explore that went live on Amazon TODAY! You are going to want to snag it up quick. 5,000 sold out on HSN in a matter of 30 minutes! This machine speaks for itself. I highly reccommend the Cricut Explore over the Silhouette Cameo. It will cut your time in half, and decrease so much stress! You won’t hate craft projects or to cut with this amazing machine. Oh and you can use my easy PIN IT button so you can remember all of this when the time comes for you to purchase! 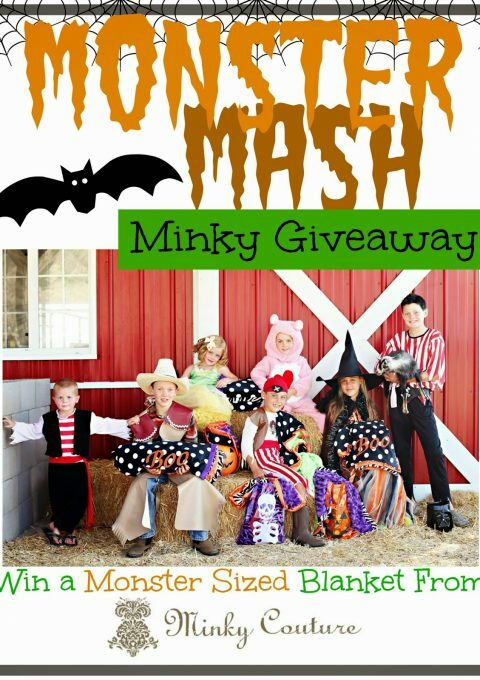 MONSTER MASH – MINKY COUTURE GIVEAWAY! Previous Post: « Saturday Steals. I’m dying for the new cricut! I thought I wanted a silhouette, but I’ve read some very honest reviews and know what i’ll be saving for. yours is the first real COMPARISON review i’ve seen. thanks! You are so welcome! I searched forever for one and there wasn’t any so I made my own! 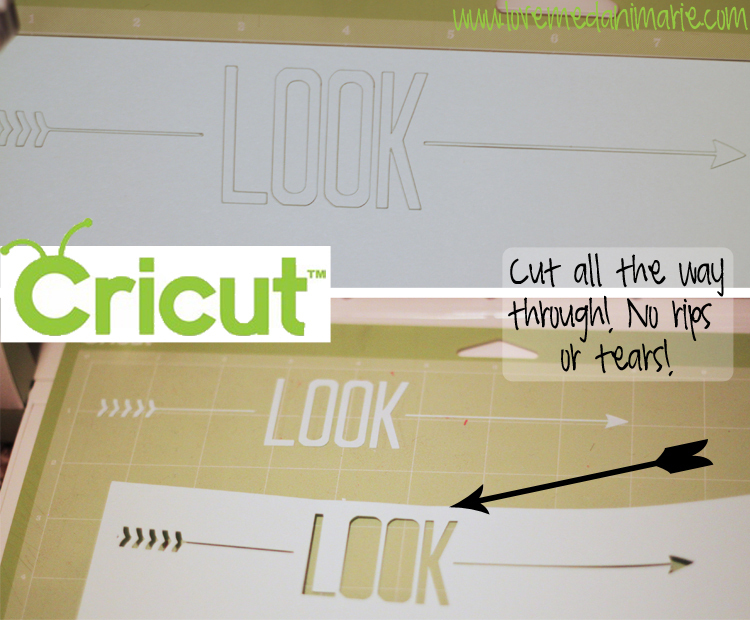 You will love the new Cricut!! Keep me posted on what you end up getting! I have wondered about the differences and now I know. I saw the Cricut at BYBC and it was interesting. I was thinking about one. Thanks for the info. Glad you aren’t in tears anymore. You are so welcome! It truly is amazing!! 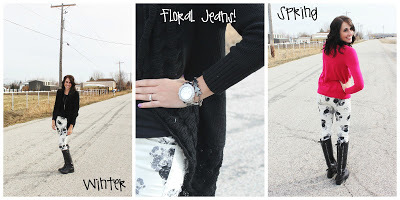 I saw it in action at ALT and swooned over it for ever! It is the greatest machine! The possibilities are truly endless with it! i own the e2…. love it, love it, love it!!! my purpose for moving to the silhouette was the one reason that you did not even mention, the print & cut option. from the information i am reading, the explore should offer this option in the second half of the year (and that is great). i thank you for your honest opinion & am currently awaiting that feature as an update prior to making my decision. although anna griffin almost had me purchasing the machine on feb. 12th HSN debut (LOL). i love wedding/ event planning & Her Freebie actually made it a great deal :-). Thanks dear! Keep me updated if you get one! You will love it if you do! Hi! I just wanna ask does This cricut needs internet connection to cut fRom my computer or ipad? Even if i’m going to design the things i’m going to cut? did you make a video cutting with metal or wOOD? If so, please let us know. Do you have a youTube channel? Hi! Yes it does need internet connection. The software is all online now which I love because it doesn’t take up space on my computer 🙂 I don’t have the metal or wood blades but am hopping to get them soon when the Cricut goes on sale in stores in March! I will make a video as soon as I get them! Just out of curiosity, did you try a new blade in the cameo? It’s possible your blade is chipped, (yes, even right out of the box) cameos cut better than that. I am finding the explore quite interesting and hope to be trying one soon. Hi Joan! I sure did. I tried it all 🙁 It was an awful experience! I got so frustrated with the machine that I never used it again after that except to write this post. The Explore is an amazing machine! I couldn’t be more pleased with it! with the new cricut is it easy to use your own fonts and designs? Yes! It is SO easy! I can whip out amazing projects in no time! So can the new cricut take images you find off the internet as well like the silhouette? Yes it can! It is so easy! You just download the image to your computer and then insert it into the Design Space! I have a friend who just bought the explore. I recommended Silhouette since I’ve had one for years and could help her out but the sales clerk talked her into the explore. does explore have a trace feature? cricut design space has a trace feature that’s automatic. you can’t tweak it like you can on the silhouette. however, you can edit out a background on a simple image in just a click. its pretty sweet but only for simple images. silhouette designs studio does a better job with more complex images. Hey there! I really liked Your review. I am trying to talk myself into getting the Explore….but i dont like that i will not own images that i do not buy or that i dont havr on a cartridge. I dont like that you have to linK each cartriDge either. What are your thoughts on that? i’am trying to find a machine that cuts vinyl letters you put on cups or ornaments. which one is best. i give these out at reunions but buying from a company has gotten really expensive. thanks, for your opinion. I think both machines are great. IT seems AS if you are very BIAS based on what you received for FREE. Thank you so much for this REVIEW. I currently have AN EXP2 AND HAVE BEEN HAPPY WITH IT WITH THE exemption of having to purchase images OR cartridges. DO you HAVE to PAY FOR a subscription OR PURCHASE cartridges at ALL TO USE THE EXPLORE? I’m ALSO assuming THAT THE CARTrIDGES that I DO HAVE WILL ALSO WORK IN THE EXPLORE. I REALLY WANT TO BE ABLE TO CREATE MY OWN IMAGES AND FONTS WITHOUT BEING RESTRICTED TO ONLY those available. I agree 100% with you about the quality of Cricut on cutting. In my opinion Provo Craft has the best cutter machine but you forgot a very important question: What about the freedom to create? They use a lot the word create but everything there is almost finished and you need just to put all parts together and voilà! It’s not create something. the software is not good yet and we feel limited and dependent of shapes created for someone else. I quitted with Cricut because I’m a free person and now I use other machines. this is because silhouette cameo became the number 1. I Don’t own either of These machines and would have loved to really read a complete comparison. I’ve been wanting a Silhouette for a long time, but since the Explore came out, I’ve wondered about it. There are too many people out there who Love their silhouette machines for what you have said about it to be true. Yes… I know electronic cutters can have their problems and drive us crazy. I own a Pazzles machine and never have really liked it, but it has done fine part of the time and other times had problems. you act like the silhouette wouldn’t cut what you tried at the beginning and you never tried it again. I could not see the light colored print used in your two comparison boxes above, so if I’m asking about anything you mentioned, Im sorry. Your whole blog is hard to see, but at least I could highlight the rest of the print and read everything but those boxes. What I would have really liked to read about are the differences in the actual designing process and the kinds of files you can use. 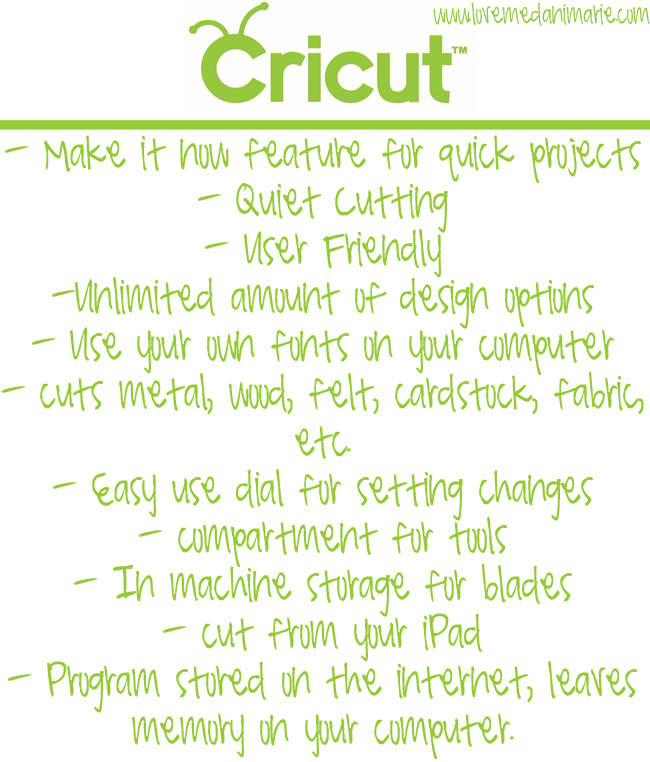 Do you Have to purchase a subscription to the cricut website (sorry… can’t remember the name of it right now) in order to use the explore or can you totally design your own things or use files found for free on the internet and Any True Type fonts etc.? Would also liked to read a comparison of the actual software program the machines use. I’ve heard that the silhouette software is very easy to learn and use. And have never seen anything about the cricut software. This makes me wonder. Provocraft has never liked to play nice with other company’s machines and/or files so before I would purchase the explore I would have to know that I would not be tied totally to a cricut website to get shapes, fonts and files to use. once you get an electronic cutter, there shouldn’t be a continuing cost like subscribing to the cricut website if you don’t want to do that. Some of us don’t have a never ending flow of money for our crafting and provocraft should respect that! Since I also have both machines i can try to answer your questions. cricut design space has a $9.99 monthly or $99 yearly “access” to images. this does not include all images. just some images. silhouette studio has credits for images that you will actually own. i pay $25 per month for $250 credit in images, fonts, everything available in their store. must items are $.99, many are on sale weekly for less. plus there is a free weekly image available. i download the images i purchase and they live on my pc so i don’t need internet access to create a project with existing images. you can import svg files and images into both cricut design space and silhouette studio. you don’t need a subscription to cricut or silhouette to use either. however, its very convenient to have the subscriptions. 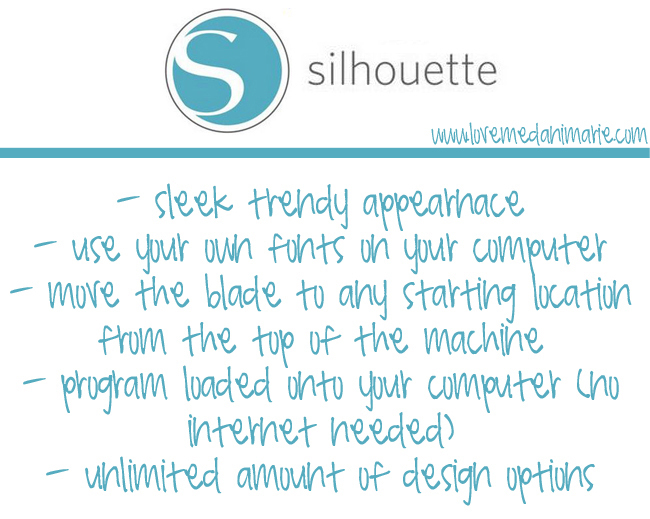 i give silhouette the trophy in the design department and customizations. i give cricut the trophy in the accuracy and clean cut department as well as ease of use. i think cricut took their customer base into account and made something for people who were accustomed to the limitations of cartridges. for prior cricut owners the design space is a huge upgrade. for silhouette owners and the like, its not a big deal. Thank you ever SUCH for your detailed answer. I had similar questions. wHY can’t there be a machine that has the flexibility and design capabilities of the silhouette and the cuttin ability and accuracy of the cricut? the silohuette cuts okay, but i feel like more often than not i have to do a test cut with new images and switching say from vinyl to cardstock. also with silhouette if i cut say 5 dresses from one piece of material, be it vinyl, cardstock whatever it’s likely at least one of those cuts will need to be redone. it’s frustrating, time consuming and costly. i have tried different blades and I’ve also made sure to clean the blades because i know vinyl can leave residue. I own both the cricut explore and the silhouette cameo. I love the silhouette studio designer edition software. it has cricut beat in that department because of its versatility (more extensive library of designs, offset feature, fill page with a single image, more detailed design options and no internet required). i often create a design in silhouette’s software and save as png, then bring it into cricut design space to cut. cutting is definitely easier on the explore. I love how colors sync to their own mats to make the projects easier to cut and piece. the actual cuts are perfect! no hanging chads 🙂 I think both machines have their pros and cons. i’m just happy to own both. All I want is to fill the page with different names. Which one is better for that? Thanks for such a great comparison! just wondering if you’ve used either machine to do vinyl cutting? thanks! I am a crafter of candles, body care, incense, etc. I am not very computer savvy and want a machine where i can make my own labels for my products. I have a logo. I would also like to make my own packaging if i can. any advice on which machine would be best for me? I am the owner of a small flowershop and Can think of many things i could use a cutter for, so i have been trying to figure out which one i should get. You have made it much easier For me to deCide! If the Cricut explore is able to cut or draw any images you download, can it cut or draw silhouette designs? i am interested in purchasing a cricut or silhouette for my daughter. First, let me say, she is 15 years old. 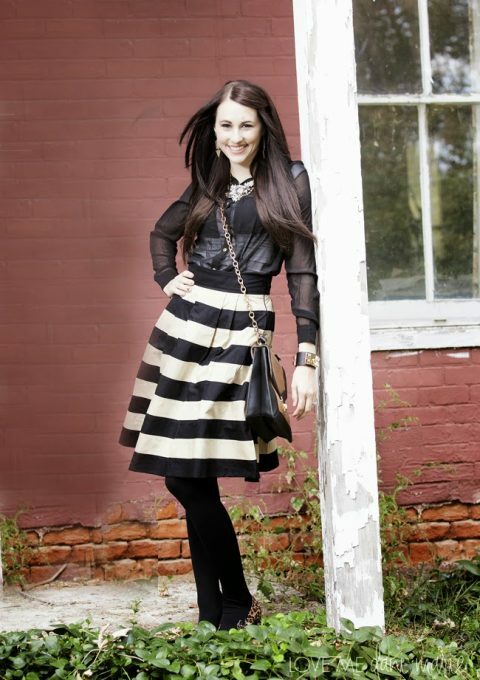 she has her own business on Store envy and is actively making and selling her product – cheer bows. I found your comparison and wanted to let you know that one of the creators of of Cricut Cutter just launched a product on Kickstarter. Its called the SHOTBOX, a pop up photo light studio. Take a look and feel free to share with your readers if you would like. Wish I had seen this before I dished out big bucks for a silhouette I absolutely hate!!! It stays in the box. HATE THIS MACHINE!!!! Can it really cut wood? And if so what type and thickness? Also, is the Explore Air even better? Do you know? Will the circuit connect wirelessly to my iPad? And if so which machine?